Happy Thursday and welcome to the Doodlebug blog. 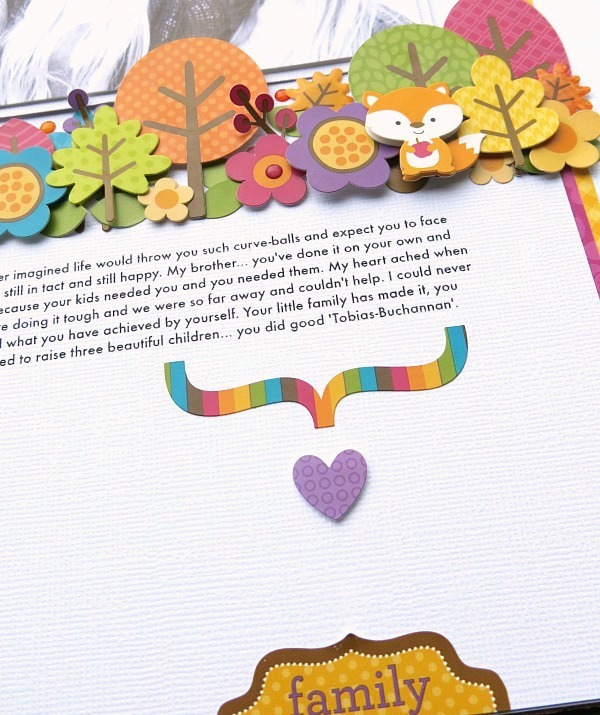 It's Melinda with you today and I'm sharing my 'Friendly Forest' layout which just happens to have it's very own embellishment forest! I set out to create a relatively clean and simple layout as I wanted the focus to be on the photo and the journaling. It was kind of a letter to my brother with a photo of his beautiful little family so I didn't want to go over the top with papers and embellishments as he isn't that way inclined. But as you can see... I went a little crazy with my forest because once I started sticking those little trees and critters down I just couldn't help myself and completely changed my original plan and made a forest instead of a small cluster. TIP: Because I wanted to layer my embellishments with foam pop dots I used baby powder to remove the existing sticky adhesive from the pieces before attaching the new foam dots. It works like a charm and makes our layout smell like it's just had a bath. 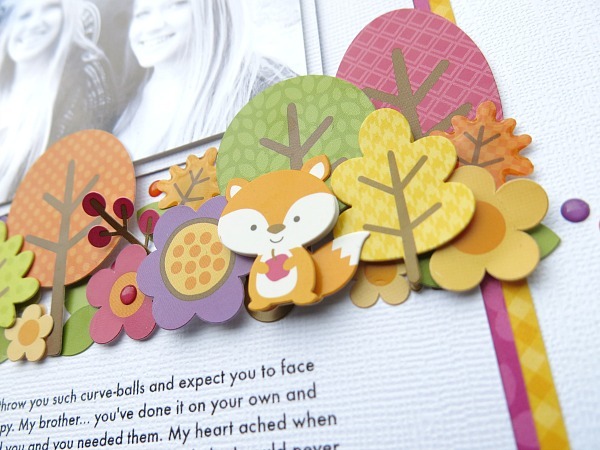 Friendly Forest: Forest Friends (4335), Fall Floral (4328), Friendly Forest (4364), Icons Cardstock Stickers (4370), Fancy Frills Cardstock Stickers (4371), Mini Doodle-Pops Who's Hoo (4427), Mini Doodle-Pops Forest Friends (4426), Sprinkles Falling Leaves (4398). Cardstock Lily White (3402). Thank you for stopping by today and don't forget to pop back in tomorrow to be inspired by Tya's mini flip frame. Another stunning layout Melinda !!! Very cool layout. I love the black/white photo. Message left on FB also. This black and white picture with the colorful details it's a great idea that I will definetly try! So love this layout! I shared on Facebook! Wow, what a gorgeous layout! I love the forest you made and that its against a white background, simply stunning. LOVE your pretty forest and BEAUTIFUL journaling!!! THANK YOU for sharing. I am so far away from my family too and find the distance hard at the best of times. 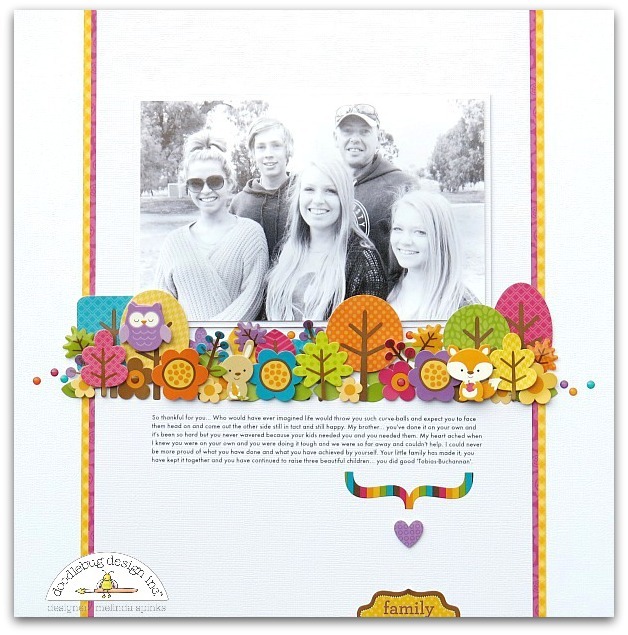 What a way cool layout - love how she used the Friendly Forest collection!! Awesome!! Shared this awesome layout using the Friendly Forest collection with my friends on facebook!!! This layout is stunning!! I love how the embellishments stand out! !